FERC Addresses NERC’s 2014 Business Plans and Budgets November 1 – FERC issued an orderaccepting the 2014 business plans and budgets submitted by NERC on behalf of itself, the Regional Entities, the Western Interconnection Regional Advisory Body, and the Reliability Coordination Company (RC Company). FERC directed NERC to submit a compliance filing within 30 days regarding how NERC will allocate $3.8 million in a manner that is consistent with NERC’s Working Capital and Operating Reserve Policy, and accepted the business plan and budget for the RC Company subject to the outcome of other pending proceedings before FERC. FERC Survey Seeks FFT Program Information October 31 – FERC is conducting an annual survey of NERC Regions’ Find, Fix, Track, and Report (FFT) programs for minor Reliability Standard violations. In letters sent to FRCC, MRO, NPCC, RFC, SERC, SPP, TRE and WECC, FERC requests that Regions “provide all data, correspondence, and other supporting information used by . . . staff to evaluate and conclude that these possible violations qualified for FFT treatment” as well as evidence that the issue was “successfully remediated.” Responses to the survey are due by December 16, 2013. NERC Enforcement Actions October 30 – NERC filed with FERC four Notices of Penalty in individual dockets, as well as a Spreadsheet Notice of Penalty addressing 60 violations of 15 standards. NERC Filings – Recent NERC filings include: (1) errata to petition for approval of proposed reliability standard PRC-005-2; (2) analysis of NERC standards process results for the third quarter of 2013; and (3) a series of filings containing the 2014 NERC business plans and budgets, submitted to the various Canadian provinces. DOE IG Evaluates FERC’s Internal Cybersecurity Measures October 23 – The Department of Energy’s Office of Inspector General released an annual evaluation of FERC’s internal cybersecurity, focusing on the Commission’s role in gathering and analyzing data pertaining to energy markets. The report praised some of FERC’s security measures, but found that that numerous computer resources remained vulnerable with a critical or high level of risk. 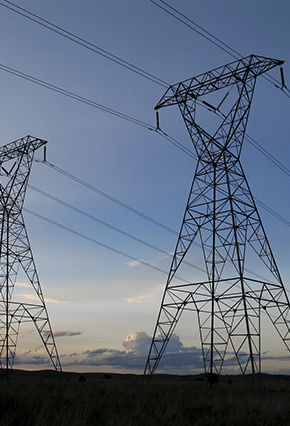 The report indicates that FERC is continuing to update its systems to resolve vulnerabilities. Two New Cybersecurity Awareness Bills Introduced– A pair of bills promoting cybersecurity awareness were recently introduced in Congress. On November 1, Senators Roy Blunt (R-MO), Sheldon Whitehouse (D-RI), Lindsey Graham (D-SC), and Richard Blumenthal (D-CT) introduced S. 1638, the Cyber Security Public Awareness Act of 2013, which would institute new reporting requirements for national security and law enforcement agencies, including the Departments of Homeland Security, Defense, and Justice, to submit reports to Congress on attacks on federal networks, investigations of cyber crime, and other impediments to appropriate public awareness of common cyber security threats. On October 30, in the House of Representatives, Rep. Jim Langevin (D-RI) introduced H. Res. 399, which would support the goals and ideals of National Cyber Security Awareness Month and raising awareness and enhancing the state of cybersecurity in the U.S.
WECC Releases TPL Coordination Analysis Report October 31 – WECC released its 2013 TPL Coordination Analysis Report, which summarizes Transmission Planner (TP) and Planning Coordinator (PC) responses to a questionnaire on planning assessment practices and makes recommendations on the coordination and standardization of planning assessment practices. WECC issued the report as a part of its continuing response to the FERC/NERC joint report on the Sept. 8, 2011 Arizona-Southern California Outages, in which FERC and NERC recommended that WECC ensure a coordinated review of Transmission Planner (TP) and Planning Coordinator (PC) Studies. EPRI to Coordinate NASPI Community Meetings – Beginning in January 2014, the Electric Power Research Institute (EPRI) will become the meeting coordinator of the North American SynchroPhasor Initiative (NASPI). Until now, NERC and the Department of Energy (DOE) have funded NASPI meetings and work. DOE will now become the principal funder, EPRI will coordinate the community meetings, and NERC will be involved in a long-term advisory capacity.